Unfortunately, the Hornet 12v Mini Air Compressor is no longer available. You can explore other items in the Air Compressor category yourself to try and find the perfect replacement for you! 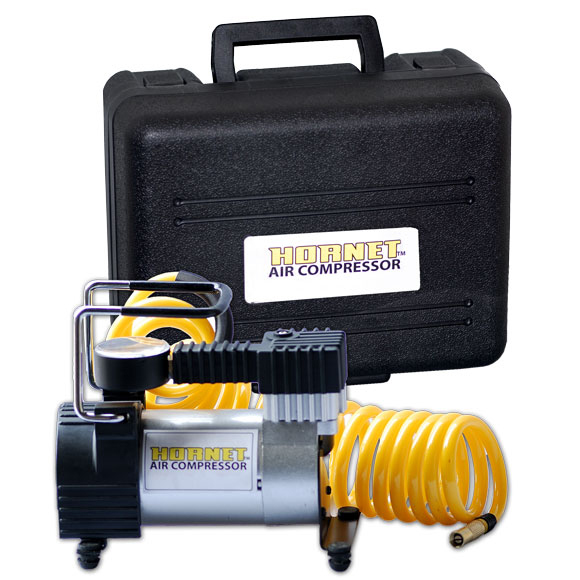 Hornet air compressor is a 12 volt air pump designed to handle a variety of heavy duty jobs. Hornet air compressor can fill an average tire in 2-3 minutes. It has a high quality brass nozzle tip and comes with two additional nozzle adapters to work with anything from playing balls to inflating a mattress. It is also equipped with a pressure gauge for convenience. The high flow rate and 100 PSI pressure make Hornet the top choice for users who desires more frequent use and a wider range of capabilities out of a 12 Volt compressor. This portable inflation device plugs right into your vehicle's 12V cigarette lighter. It is ideal for inflating tires, air mattress, beach toys, and sport equipment. Take it with you on your next camping trip. Inflates average tires in 1.5-3 Min. Pressure Gauge: Yes Dimensions: 6.57" x 3.61" x 6.18"
For any questions, please contact us at 1-818-701-9200.